Heparin Disaccharide Standard Mix (HD Mix) – please email info (at) galenlabsupplies.com for further information. The heparin disaccharide mix is designed for disaccharide composition analysis of heparin and/or heparan sulphate digested by heparinase enzymes. Convenient and ready to use the HD Mix is provided as a predissolved aqueous solution of heparin disaccharides HD001, HD002, HD003, HD004, HD005, HD006, HD007 and HD008. The Heparin Disaccharide Standard Mix (HD Mix) contains enough solution for 10 x 100µl applications. 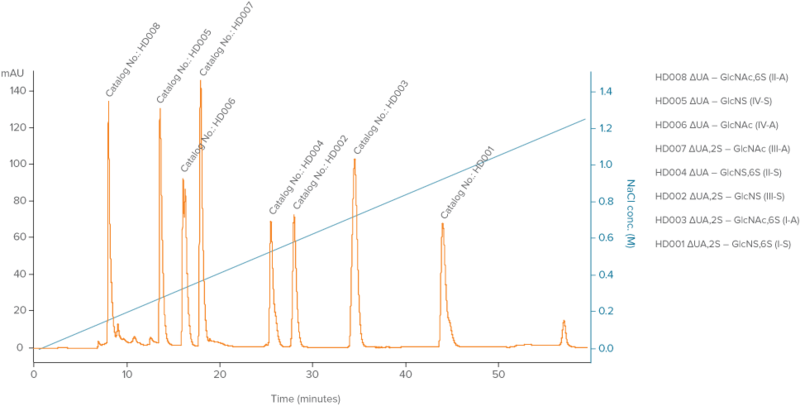 The profile below shows a typical separation of the disaccharides standards.